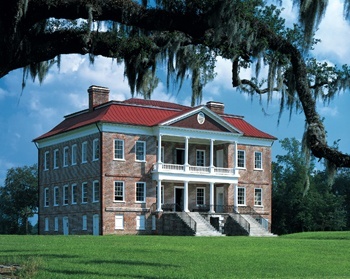 Drayton Hall is one of the oldest examples of Georgian Palladian architecture in the United States, built by John Drayton from 1738 to 1742. Drayton Hall remained in the Drayton family for seven generations until being sold to the National Trust for Historic Preservation by Charles and Frank Drayton in 1974. In 1977 the property opened to the public. The property was on 633 acres when sold to the National Trust. It is now on 125 acres, though the remaining property is still largely connected even though the State of South Carolina took possession of the remaining 508 acres. Originally the main house was flanked by two buildings, one serving as the kitchen and the other for laundry. Today the structure consists of the main house and privy. An earthquake destroyed the laundry flanker in 1886 and a hurricane destroyed the kitchen flanker in 1893. There is a remaining structure, the caretaker’s house that survived and now holds the museum shop. Drayton Hall carries with it a lot more than one family’s history. Native American history is well documented where Drayton Hall would later be built. African Americans brought over as slaves by the Drayton family played a large role in developing and maintaining Drayton Hall, and even played a modern day historical resource until 1998 when the grandson of the original caretaker, Richmond Herschel Bowens, died. When in Edisto Beach, take a short drive to visit. For hours, directions and much more visit here.